In today’s hectic world every minute counts! At Silver Creek Dentistry, we understand how busy our patients’ lives are, and we’ve equipped our office with technology that allows us to make dental procedures more effective and comfortable for our patients. Your dentist in Ripon discusses same-day dentistry and some of the efficient services we offer. Porcelain crowns are designed to replace a tooth that has been damaged or fractured beyond the scope of what a dental filling can repair. Fitting over your natural tooth structure like a cap, a crown looks and functions just like your tooth. The process for completing a crown used to require at least two long appointments, and take anywhere from 2-4 weeks for a dental laboratory to fabricate the final product. This was a lot of time for our patients to invest. CEREC is a machine that has revolutionized the crown making process. Now in one appointment at our office, our patients can leave with a high quality porcelain crown that is completely finished and ready to function! This process saves our patients multiple appointments, struggling with unreliable temporary crowns, and weeks of waiting for their final restoration. Dr. James Hamman is certified by the American Dental Society of Anesthesiology, which means he can safely perform all forms of dental sedation in the comfort of our office. Not only is this a more comfortable and relaxing way to receive the dentistry you need, it’s also very efficient because it allows Dr. Hamman to complete multiple procedures at one time. 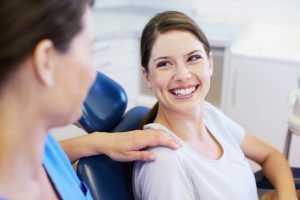 Dr. Hamman, Dr. Johnson, and the entire team at Silver Creek Dentistry are dedicated to patient comfort and offering the highest quality dental care available. You’ll always notice new equipment being added to our office that helps us make procedures more efficient for our patients. We know you’ll appreciate our patient centered approach!